The pathophysiology of CHAOS results from trapping of pulmonary secretions, which are normally evacuated through the fetal upper airway. Secretions accumulate in the bronchopulmonary tree and cause hyperinflation of the lungs. Excessive distention of the lungs, in turn, leads to an increase in the intrathoracic pressure, compromising venous return and cardiac output and potentially resulting in nonimmune fetal hydrops. It is noteworthy that hydrops is better tolerated by patients with CHAOS than by those with other congenital abnormalities associated with hydrops. In select patients who present with life-threatening hydrops and short-segment lesions or webs, fetoscopy with wire tracheoplasty may be of some benefit. Determining which patients are more likely to benefit from tracheoplasty poses a great challenge, and this procedure is typically reserved for fetuses who present with hydrops early in pregnancy (17-30 weeks’ gestation). Because patients with CHAOS seem to tolerate hydrops better than those with other disease processes, expectant management is generally preferred for those who present later in the third trimester until an EXIT delivery can safely be performed. An EXIT-to-delivery procedure is the procedure most frequently performed in fetuses with CHAOS. The authors' current practice is to offer an EXIT delivery of all viable fetuses and to offer fetoscopy with wire tracheoplasty to hydropic patients with CHAOS who present between 17 and 30 weeks' gestation. Outcomes data are unavailable. The EXIT procedure requires careful planning with a multidisciplinary team, typically including two pediatric/fetal surgeons, one obstetrician, one neonatologist, one ultrasonographer, and one nurse scrub. 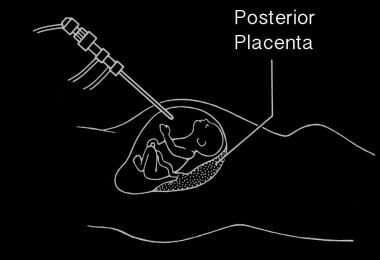 Appropriate anesthesia and tocolytics are important to prevent uterine contractions and placental separation. Uterine atony can lead to diffuse bleeding, and a special uterine stapler (uterine stapler with absorbable staples [US Surgical Corporation, Norwalk, CT]) can reduce the risk of hemorrhage during the EXIT procedure. Despite remarkable progress in CHAOS management, tracheostomy dependence and speech impediments are to be expected. A diagnosis of CHAOS in the midsecond trimester suggests a poor prognosis, in that many progress to in-utero fetal demise (IUFD). Patients who present in the third trimester without signs of hydrops frequently survive until delivery, as they typically have only a partial obstruction. Fang SH, Ocejo R, Sin M, Finer NN, Wood BP. Radiological cases of the month. Congenital laryngeal atresia. Am J Dis Child. 1989 May. 143(5):625-7. [Medline]. Richards DS, Yancey MK, Duff P, Stieg FH. The perinatal management of severe laryngeal stenosis. Obstet Gynecol. 1992 Sep. 80(3 Pt 2):537-40. [Medline]. Scurry JP, Adamson TM, Cussen LJ. Fetal lung growth in laryngeal atresia and tracheal agenesis. Aust Paediatr J. 1989 Feb. 25(1):47-51. [Medline]. Watson WJ, Thorp JM Jr, Miller RC, Chescheir NC, Katz VL, Seeds JW. Prenatal diagnosis of laryngeal atresia. Am J Obstet Gynecol. 1990 Nov. 163(5 Pt 1):1456-7. [Medline]. Hedrick MH, Ferro MM, Filly RA, Flake AW, Harrison MR, Adzick NS. Congenital high airway obstruction syndrome (CHAOS): a potential for perinatal intervention. J Pediatr Surg. 1994 Feb. 29(2):271-4. [Medline]. Berg C, Geipel A, Germer U, Pertersen-Hansen A, Koch-Dörfler M, Gembruch U. Prenatal detection of Fraser syndrome without cryptophthalmos: case report and review of the literature. Ultrasound Obstet Gynecol. 2001 Jul. 18(1):76-80. [Medline]. Tessier A, Sarreau M, Pelluard F, et al. Fraser syndrome: features suggestive of prenatal diagnosis in a review of 38 cases. Prenat Diagn. 2016 Dec. 36 (13):1270-1275. [Medline]. Paoletti D, Robertson M. Congenital high airways obstruction syndrome - first and second trimester diagnosis. Australas J Ultrasound Med. 2014 May. 17 (2):82-84. [Medline]. [Full Text]. Crombleholme TM, Sylvester K, Flake AW, Adzick NS. Salvage of a fetus with congenital high airway obstruction syndrome by ex utero intrapartum treatment (EXIT) procedure. Fetal Diagn Ther. 2000 Sep-Oct. 15 (5):280-2. [Medline]. DeCou JM, Jones DC, Jacobs HD, Touloukian RJ. Successful ex utero intrapartum treatment (EXIT) procedure for congenital high airway obstruction syndrome (CHAOS) owing to laryngeal atresia. J Pediatr Surg. 1998 Oct. 33 (10):1563-5. [Medline]. Bui TH, Grunewald C, Frenckner B, Kuylenstierna R, Dahlgren G, Edner A, et al. Successful EXIT (ex utero intrapartum treatment) procedure in a fetus diagnosed prenatally with congenital high-airway obstruction syndrome due to laryngeal atresia. Eur J Pediatr Surg. 2000 Oct. 10 (5):328-33. [Medline]. Hartnick CJ, Rutter M, Lang F, Willging JP, Cotton RT. Congenital high airway obstruction syndrome and airway reconstruction: an evolving paradigm. Arch Otolaryngol Head Neck Surg. 2002 May. 128(5):567-70. [Medline]. Saadai P, Jelin EB, Nijagal A, Schecter SC, Hirose S, MacKenzie TC. Long-term outcomes after fetal therapy for congenital high airway obstructive syndrome. J Pediatr Surg. 2012 Jun. 47(6):1095-100. [Medline]. Ryan G, Somme S, Crombleholme TM. Airway compromise in the fetus and neonate: Prenatal assessment and perinatal management. Semin Fetal Neonatal Med. 2016 Aug. 21 (4):230-9. [Medline]. Martínez JM, Castañón M, Gómez O, Prat J, Eixarch E, Bennasar M, et al. Evaluation of fetal vocal cords to select candidates for successful fetoscopic treatment of congenital high airway obstruction syndrome: preliminary case series. Fetal Diagn Ther. 2013. 34 (2):77-84. [Medline]. [Full Text]. Roybal JL, Liechty KW, Hedrick HL, Bebbington MW, Johnson MP, Coleman BG. Predicting the severity of congenital high airway obstruction syndrome. J Pediatr Surg. 2010 Aug. 45(8):1633-9. [Medline]. Crombleholme TM, Albanese CT. The fetus with airway obstruction. Harrison MR, Evans M, Adzick NS, Holzgreve W. The Unborn Patient: The art and science of fetal therapy. 3rd. Philadelphia, PA: W.B. Saunders Company; 2001. 24.